This image is from January 2015 and is themed around Burns' Night, the 25th January. As such most of the items shown are Scottish. The reel is a William Robertson "Struan" patent, the fly boxes are an early and later version of the Wheatley "Loch Leven" fly box - I particularly like the scenic version of this popular accessory. 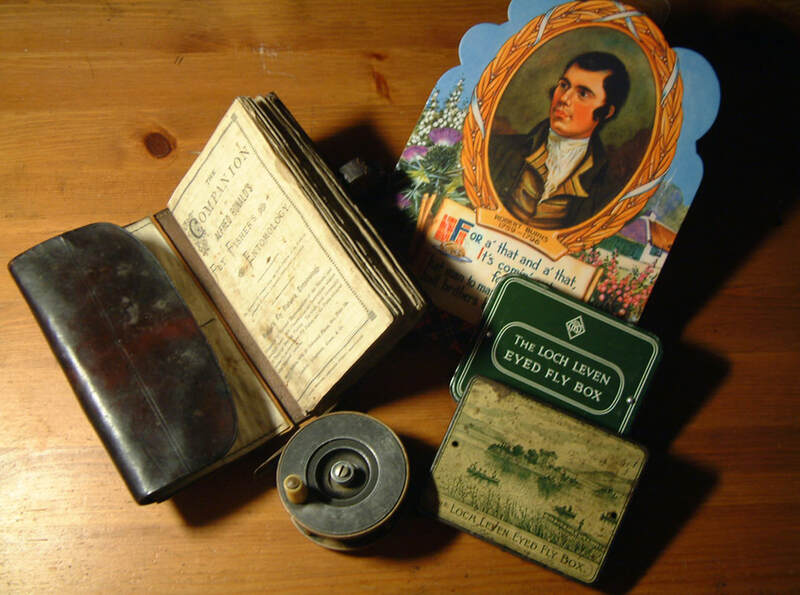 This scene was used for the May 2017 page and features the treasured possessions of "Wee Jimmy" who is fishing daft. Jimmy was living somewhere in central Scotland in the 1950's. His "go to" rod is a mounted, war-surplus tank aerial but his Grandad is teaching him to fly fish using his most precious item, a bamboo combination rod from Japan, brought home by his father from the Far East. You can see a few flies made by his Grandad in a cough sweet tin in the middle of the picture. The image for July always has some connection with the USA. 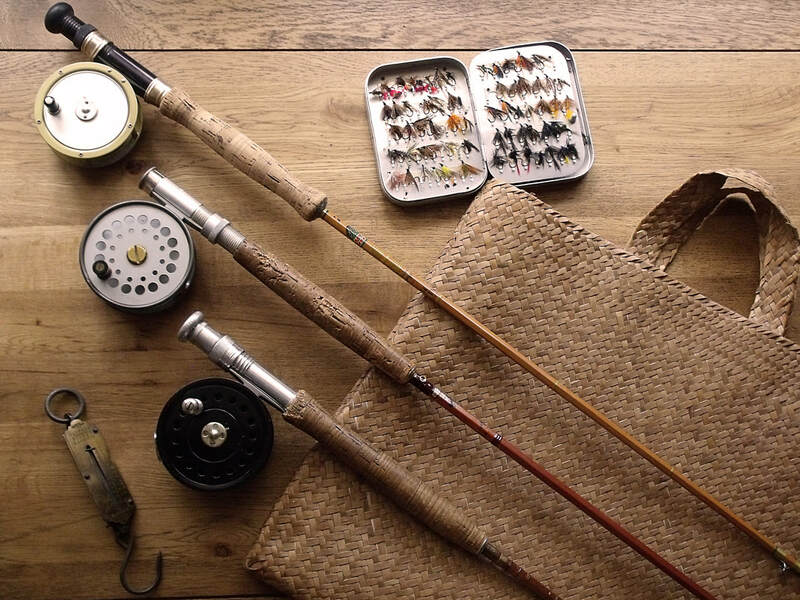 This particular image gave me a break from fly fishing tackle to feature some American bait fishing items, though ironically the rod was made and marketed in the UK by Ogden Smith. Although they lie outside the usual remit of WVFFM, I do have a few of the bait-casting multipliers shown in the picture. Another July picture themed on the California orange harvest. 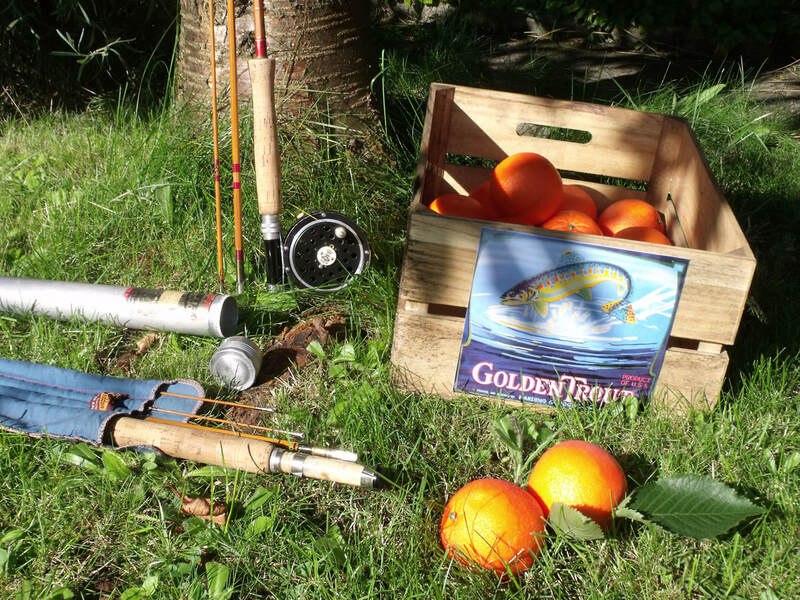 There area a number of fruit crate labels that feature a fishing theme and I wanted an excuse to use one as a prop. The rods are a Heddon Blue Waters and A Shakespeare "Tony Accetta" fly rod made for trade by Gene Edwards. 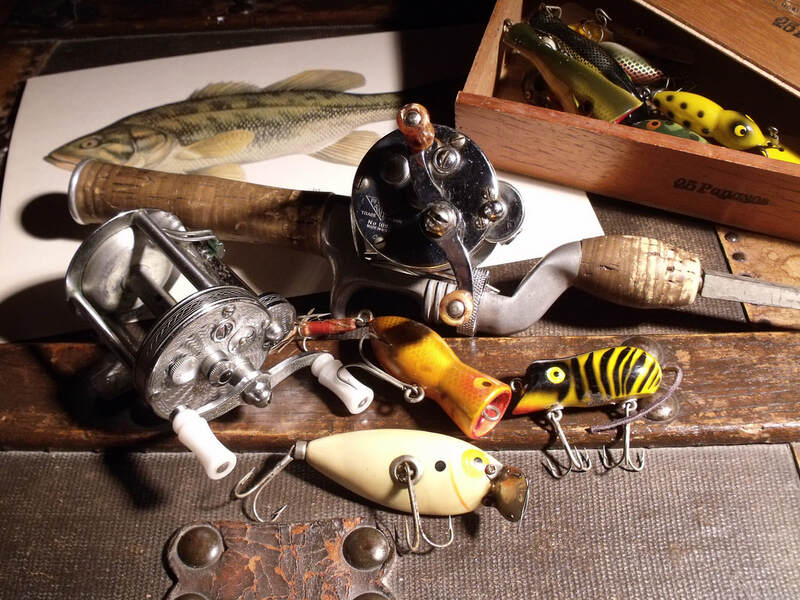 I have since acquired a very pretty older Pflueger Medalist which would have looked really good in this scene. This was a fun shot to set up, and represents every collector's dream, a spectacular barn find. 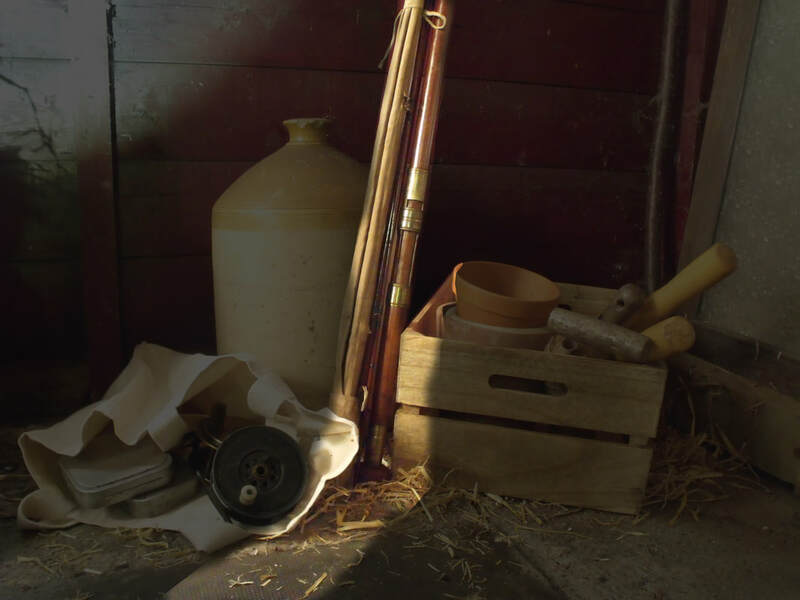 The salmon fly rod illuminated by the light from the barely open door is by William Blacklaws of Kincardine O'Neil on Royal Deeside. You might also recognise a Moscrop Manchester reel, one of the larger sizes retailed by Gamages of London. 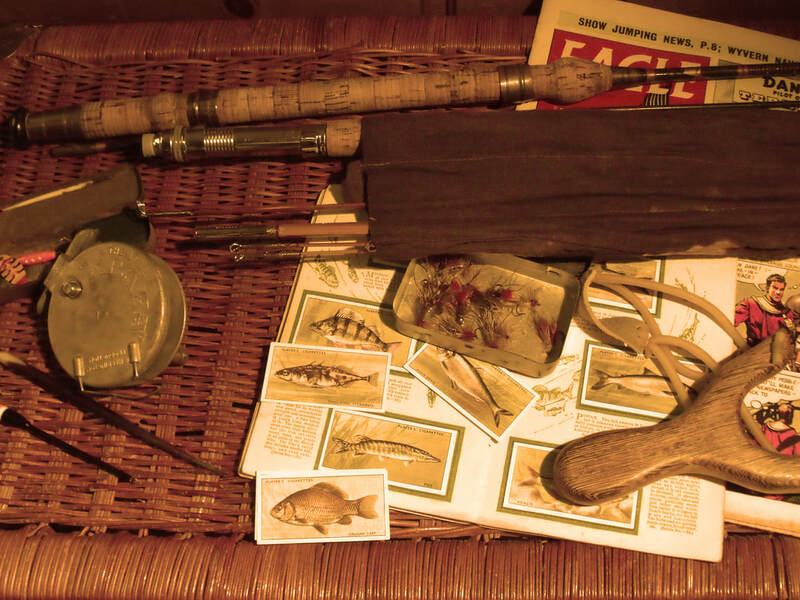 Mitre Hardy Jewel reel and Nymph rod, made by Hardy in collaboration with Benjamin Crook, sporting goods suppliers, who owned the "Mitre" brand. Along with the rods is a traditional woven reed trout bass bag and one of my own "working" Wheatley" fly boxes. I had to include this one here because it is my wife's favourite, "Skeletons Dancing" from October 2017. 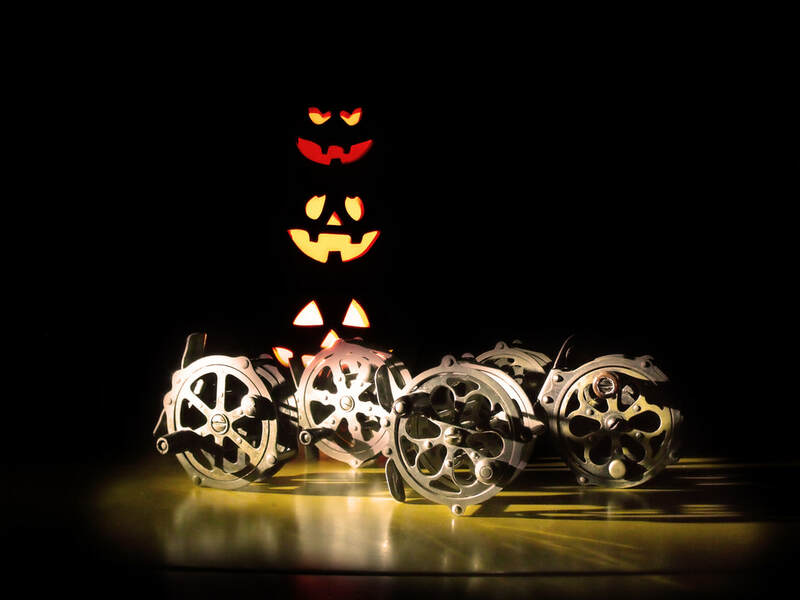 Hallowe'en? Get it?